Kevin represents the word “keep” in English (obviously). All you need to know about Kevin is that he hates change. He likes things how they are; he likes you how you are. But if you try to change things, he gets a bit angry and starts shooting windows. Just joking. We often use this “keep” structure to encourage a positive atmosphere. This might be in an online forum, at a school or in your local giraffe tennis club — anywhere where you’ll find groups of people (and giraffes). This is an informal meeting, so we like to keep things casual by encouraging people to wear what they like. This is a work-based forum. Please try to keep your comments formal and direct. OK! No need to call him that. Let’s keep things respectful. Guys! C’mon — keep things civil. Please! We work hard to keep the country safe. You can’t keep everybody happy all the time. But you can try! We don’t know what time we’re leaving for the camping trip on Thursday, but don’t worry — I’ll keep you posted! I got a live news feed on my phone to keep me up to date. But it’s really annoying. I might delete it and take my life back. OK. But if you see him again, please keep us informed. He’s very dangerous. And of course, we use it to talk about making sure things look great! That’s a nice bike! Make sure you keep it clean. Mike? Yeah, he always keeps himself neat and tidy. A bit of a hipster. By now, I guess you’ve got a good understanding of how “keep” works. So it wouldn’t surprise you if I told you that you can add a verb to “keep,” and it creates the meaning of “continue,” right? This can be a great way of providing enthusiasm and motivation. Keep trying – you’ll find something. I keep telling you not to start fights with biker gangs. You’re always gonna lose! But you never listen. Sometimes there’s a political or social issue that needs to be addressed. Perhaps politicians are ignoring people who are trying to bring the issue into discussion. We need to keep talking about this. It’s a serious issue, and we just need to keep talking about it. A lot of these examples are positive and full of motivation. That’s why Kevin Keep is awesome sometimes. He can really keep you going! My cat? Oh, don’t talk to me about my cat. She keeps waking me up in the middle of the night by trying to eat my feet. Police blocked the school in an attempt to keep people from voting. Make sure you use plenty of water to keep the mixture from getting too thick. Don’t forget to unplug it when you’re not using it to keep the battery from running out. 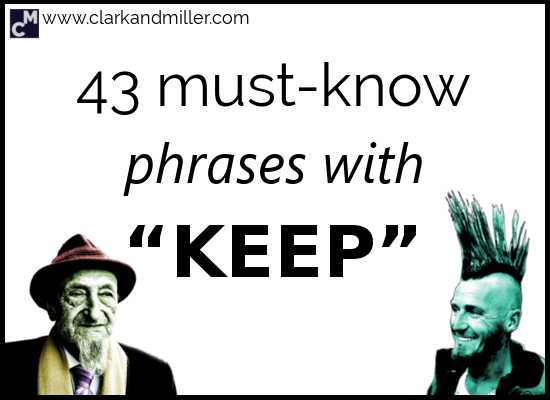 Surprisingly, there aren’t so many phrasal verbs with keep. Which is good news, right? He buried it somewhere around here. Keep on digging! We’ll find it! I like to keep up with local politics. You never know how important it can be. Stay at the same level as someone. This can be either physically (like a race) or not (like with learning English). It’s no good. She’s too fast. I can’t keep up with her! Don’t give up! It’s difficult, but you should see it to the end! Wow — this new exercise regime is pretty tough. I’m not sure I’ll be able to keep at it. Follow this plan (or path, etc.) and only this plan. Don’t do anything outside this plan. Look. This meeting will finish sooner and we’ll all get home earlier if we just keep to the meeting agenda. So stop talking about your fish collection. You know that guy who just doesn’t like socialising very much? He likes to keep his private life private. This one’s for him. I’m not much of a party animal. I prefer to keep myself to myself. This can be when you’re waiting for something to change, so you keep checking on it (like keeping an eye on the time), or when you want to make sure something doesn’t get stolen. I’m just going to the toilet. Can you keep an eye on my bags? Look carefully for something (or someone) to appear. We need some batteries, so keep an eye out for some, yeah? For more phrasal verbs, check out 7 Tricks to Understand Phrasal Verbs Without a Dictionary. There are also a lot of phrases with “keep” that don’t fit into any of these categories. OK, kids, time to visit uncle Mayhew. Keep in mind that he can’t hear very well these days, so you’ll need to shout. Here’s a loudspeaker. Another very, very common way of using “keep” is when talking about money — usually to make sure that things are cheap. Because we all like cheap, right? This method will keep your co-payment and deductible down. Electricity? Oh, we stopped using electricity so we could keep costs down. You wanna sell more bagpipes? Well, remember to keep prices low. You’ll sell millions! Stay cheerful! Don’t get depressed! Even when crocodiles eat your house and steal your job. Keep your chin up! You can’t win all the races! Keep it a secret! Don’t tell anyone! Keep it to yourself, yeah? But I think Janine’s going to get fired today. Man! They’ve updated the technology again? You really have to keep your finger on the pulse working here. This is similar to “keep your finger on the pulse,” but this time you’re staying up to date because other people aren’t excluding you. You’re part of the team! Part of the gang! You know what’s going on about everything. OK. That’s Brian. Don’t tell him anything. We’ve decided not to keep him in the loop. Stay in communication. We’re all keeping in touch these days because of social media. But is it really a good idea? Because of Facebook, I’m keeping in touch with people I have no intention of seeing again in the future. Why? Please stop making so much noise! Keep it down in there. Some of us are trying to sleep! Don’t go mad! Stay calm! If you can keep your head while under pressure, you’ll beat him. Chess is totally psychological. You’re doing awesome work! Continue! I love your blog, man! Keep up the good work! Tony? Oh, I’d keep your distance. He’s a bit aggressive after a drink. Here’s $5 for a $4.95 sandwich. But don’t give me 5 cents. Thanks! That was the fastest taxi ride to the station ever. Here’s 20. Keep the change! This is like “keep your finger on the pulse,” except it’s usually for something specific. Oh, I can’t keep track of the number of Bollywood films he’s seen. He loves them! HEY YOU! YES, YOU OVER THERE! KEEP QUIET! THIS IS A LIBRARY! I mentioned this one earlier. It basically means “be honest” or “be real.” Don’t try to be like anyone else. The first rule of hip-hop? Keep it real! Finally, if you want to tell people what to do and where not to go, then adding a preposition (or particle) to “keep” can be an effective way. In fact, you’ll see a lot of signs in England. They love signs. Test yourself on British English signs here. You’ll be surprised how hard it is. Does your workplace like to keep things casual? Or are you in a more formal environment? When was the last time you had to be kept in the loop about something? Do you like to keep your home neat and tidy? Or are you more … expressive with your stuff? Is there a serious issue that you feel we need to keep talking about? What’s the biggest distraction that keeps you from working? Did you find this useful? Do you know any people (or coyotes) that might also benefit from this? Then BE AWESOME AND SHARE! Spread the knowledge! Great posts! Keep ’em coming! Thanks Cara! We certainly will!